The Sources view allows you to configure input sources for the Processors view. Sources are divided into areas, areas provide the actual inputs for the processors view. Adding and removing sources is accomplished by using the “+” and “-” buttons on the bottom of the table. 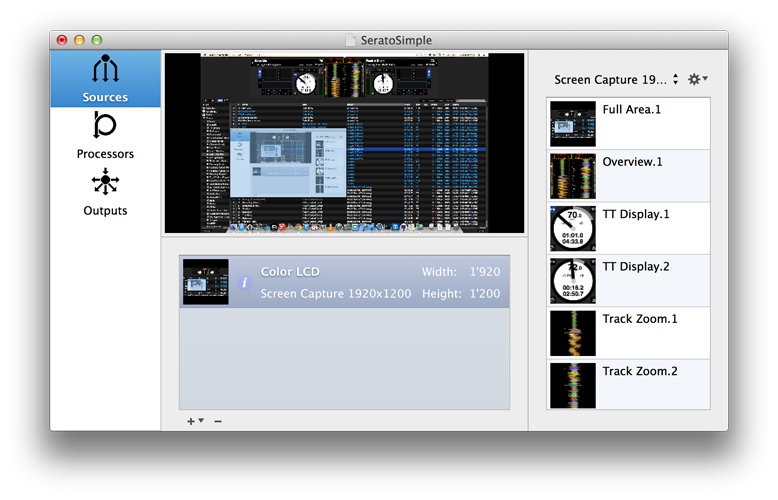 Currently, screen capture, video, Quartz Compositions and Syphon can be used as inputs. Each source has an automatically generated Area Definition, containing a single area using the entire source. Sources can be further divided into smaller areas that can be used by the Processors. Definitions can be created, edited and renamed using the action icon in the top right. Double clicking the areas table on the right quickly switches to area editing mode. 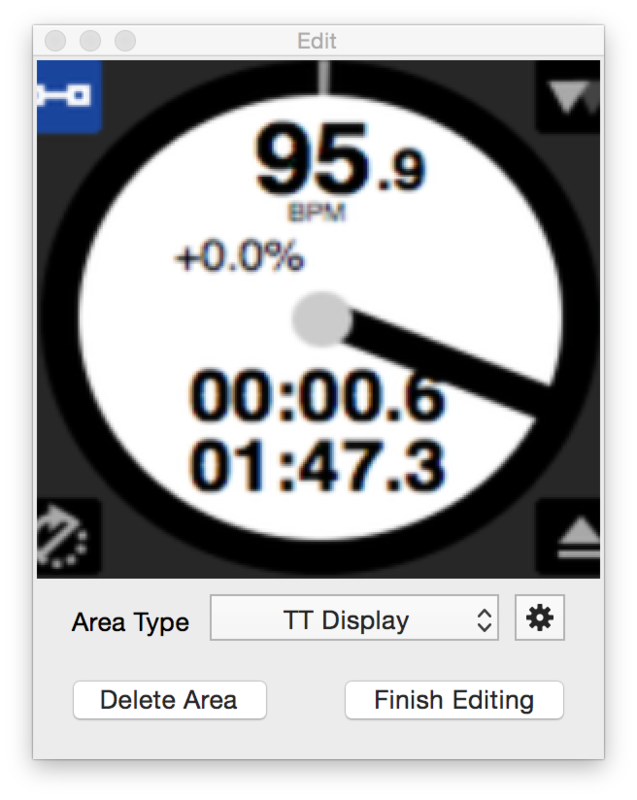 Editing areas either switches to fullscreen mode for Screen capture sources, or opens a new window for the source. Three other panels also open, the Edit Toolbar, the Preview and the Fine Adjust Panels. The drawing toolbar contains select mode and three drawing modes. Select Mode allows you to select individual areas to edit their properties, or can be moved and resized using drags. Grid mode, allows you to draw a grid anywhere, you can set rows, columns and respective spacing before drawing using the fine adjust panel, you can also change them afterwards with any part of the grid selected. This is good for single areas, also good for horizontal layouts. Mirror Mode: Draws mirrored areas, so any areas drawn on the left, draw mirrored on the right, good for vertical waves forms, limited to 2 columns, but any number of rows, as above the fine adjust lets you change that after inserting. Left aligned: Similar to mirror, but the areas aligned to the left of a divider down the middle of the source. All areas are created as grids internally, even if only one area is present, it still belongs to a grid. Grids share common values for all areas in a grid. All areas in a grid will be the same size, and have the same area type. Deleting one with the delete areas button deletes all of them, to add or remove areas from a grid, use the row and column values in the fine adjust panel. The Preview panel allows a closer view of the current selected area. The panel can be resized to get a better look. Area types define the name of the areas in the current grid. These allow you to give names to different areas, and remain consistent through different definitions. New area type names can be created using the action icon on the right of the area type selector. Selecting delete areas will delete all areas in the currently selected grid. Finish editing will exit area editing mode. The fine adjust panel allows precise control of the current grid. 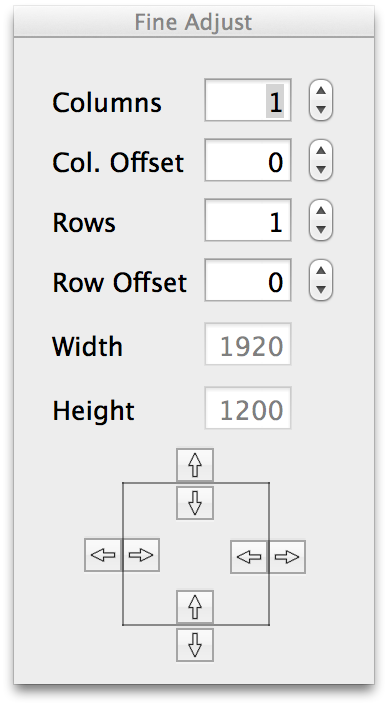 Rows and columns can be added and removed, and horizontal and vertical spacing adjusted. Clicking arrows on the bottom allow pixel by pixel sizing of areas.